Well the Victoria House situation is finally getting its official public hearing this Wednesday 19th April - at the Europa Gallery in the Sutton Council offices - St Nicholas Way, Sutton SM1 1EA at 7:30PM. See the leaflet below being distributed by the WPRA and CHAPRA. The two residents' associations (WPRA and CHAPRA) have helped gather a total of 1423 signatures against the proposal and hopefully the Councillors on the planning committee will remember who it is they represent when it comes to making the final decision. We know the current building is an eyesore and needs to be replaced ASAP but we don't want it replaced with something completely inappropriate, that will create more parking issues in the area and which we will be stuck with for at least another 50 years. What we want is for the council to deny planning permission for this Eyesore #2 and force the developers to come back to the table with something far more appropriate for the area. We have seen a number of acceptable designs over the years for a replacement development. It's time one of those was built - not this collection of ugly tower blocks. 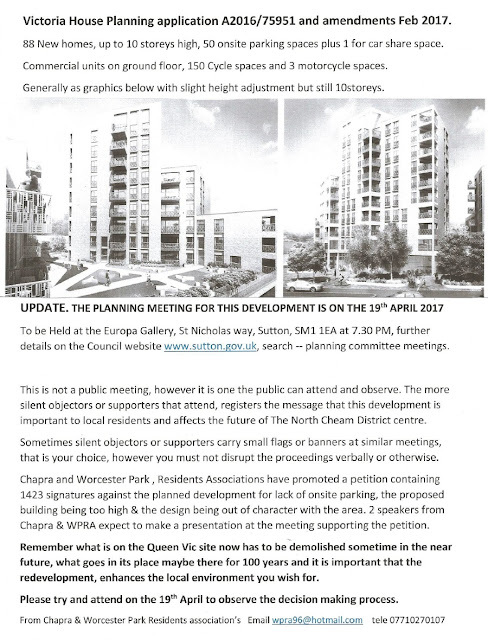 Please come along to the meeting to show the planning committee the depth of local feeling over this issue.